Who is ready for the 2018 NCAA Division II Cross Country Championships? Well, you’re in luck, because they will finally take place this weekend as part of the DII Championships Festival in Pittsburgh, Pennsylvania. NCAA DII harriers get their time in the spotlight beginning at 11 am ET on Saturday with the men’s 10K and an hour and 15 minutes later (12:15 pm ET) with the start of the women’s 6K. All of the action will take place at Bob O’Connor Golf Course at Schenley Park. According to the weather forecast, there is an 80 percent chance of rain at 11 am and the course has taken on a lot of precipitation (rain and snow) over the past week, so it could be a bit sloppy out there. We released the Pre-Championship Editions of the NCAA DII Men’s and Women’s National Coaches’ Polls last week, but it’s time to take a closer look at them in a historical context with the Championships. Since 2010, four men’s teams and only two women’s teams that held the No. 1 spot entering the NCAA DII Championships won national titles. It just so happens that those respective teams come from the same program. Adams State‘s men entered NCAAs as the top-ranked team in 2010, 2012, 2013 and 2017. The Grizzlies won national titles in all four of those years under Damon Martin’s watch. Grand Valley State‘s women owned the top spot in the National Coaches’ Poll in 2013 and 2014 as part of its record run. The Lakers took home top honors in both of those years to cap a three-peat. Adams State holds the top spot in both the Men’s National Coaches’ Poll and Women’s National Coaches’ Poll in 2018. The men have been favored five times in the past eight years and won four national titles, while the women are winless in two tries as the favorite in the same time frame. The Grizzlies will have their work cut out for themselves if the results at the South Central Region Championships proved anything. Colorado Mines topped Adams State’s men by a score of 49-57, while Adams State’s women barely held off Western Colorado 30-31. Both the Orediggers and the Mountaineers are ranked No. 2 in the National Coaches’ Polls following those efforts. 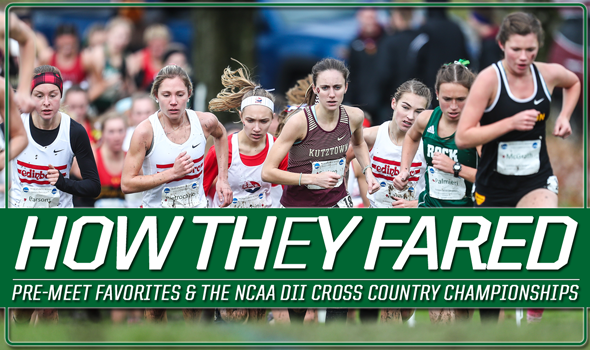 Be sure to check back in Saturday afternoon as we recap all of the action from the 2018 NCAA DII Cross Country Championships.